Broad River Electric donates to 15 local charities - Broad River Electric Cooperative, Inc.
Operation Round Up recipients (l-r) David Simmons (Scouts), Heather Swayngim (Know2), Todd Humphries (Veterans), Donna Proctor (Cherokee Pregnancy), Pam Cazel (CHAPS), Brian Harris (Sonshine Club), Nancy Jordan (BRE Charities Board), Vernon Craig (BackPack Buddies), Yolanda Kennedy (SBCC), Dean Wyatt (Broad River Leathernecks), Abbie Sossamon (Ledger), and Larry Wyles (Humane Society). WBCU’s Daniel Prince stands in front the Truck Full of Toys the station uses to distribute its donations to local children. 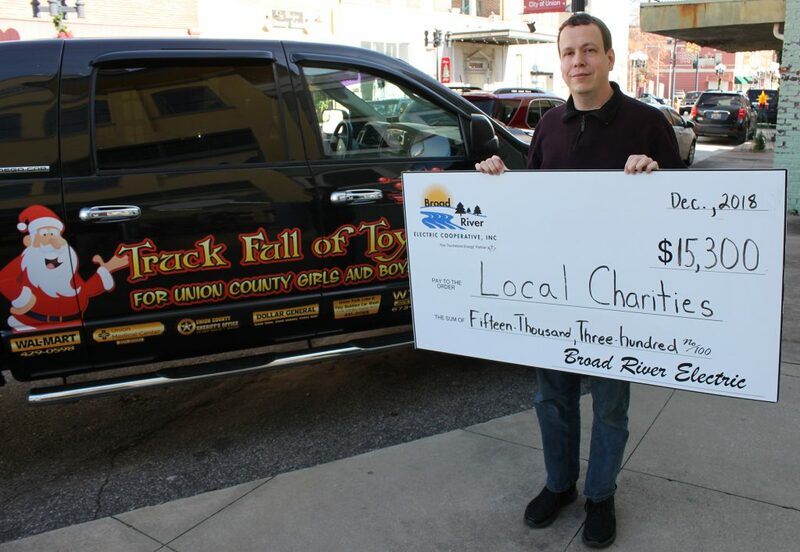 Broad River Electric Charities has distributed $15,300 from its Operation Round Up® fund to local charities this holiday season. The 15 organizations and initiatives represent a broad spectrum of causes and ministries, including toy drives, special needs, and education. Organizations receiving Operation Round Up® funds include the Broad River Leathernecks, Cherokee Co. Veterans, Cherokee Historical and Preservation Society, The Gaffney Ledger’s “Christmas is for Kids, Girls on the Run of Spartanburg, Humane Society of Cherokee County, Know2, Sonshine Club of Spartanburg, Boy Scouts of America, WBCU Truck Full of Toys, Back Pack Buddies, Cherokee Pregnancy Center, Children’s Cancer Partners of the Carolinas, Cherokee County School District, and Sisters and Brothers Committed to the Community. Broad River Leathernecks, an organization of Cherokee County U.S. Marine Corps veterans, will use their $800 donation for an annual holiday toy drive for local children in need. Cherokee County Veterans received $500 to assist with the costs of their Veteran’s Day programs and parade. Cherokee Historical & Preservation Society will use their $500 to enhance educational opportunities at the historic Fort Thicketty site. The Gaffney Ledger’s “The Christmas is for Kids” campaign raises funds from the community to ensure that disadvantaged children Cherokee County will have presents for Christmas, received $500 . Girls on the Run of Spartanburg received $1,000 to provided scholarship into their program. The Humane Society of Cherokee County, which saves lives of unwanted animals, received $500. Know2 will put the $1,000 donation to their Neighborhood Ambassadors Program. The Sonshine Club of Spartanburg, which supports special needs adults, received $1,500. The Boys Scouts of America Palmetto Council received $1,500 to fund their programs across the Upstate. Midway Baptist Church’s BackPack Buddies ministry received $1,000 to provide food for needy children. The Cherokee Pregnancy Center will use the $1,000 donated towards the purchase of a new ultrasound machine. Children’s Cancer Center of the Carolinas will use a $3,000 donation to assist families of children battling cancer. The Cherokee County School District received $1,000 for their Share Space program, which teaches local students about Mars. Sisters and Brothers Committed to the Community received $500 for their Learning Center. Donations to the selected charities come from Broad River Electric’s Operation Round Up program. Each month, the account balances of participating members are rounded up to the nearest dollar. That extra change goes to the benevolent fund that assists organizations and goodwill missions in and around Broad River Electric Cooperative’s service area. 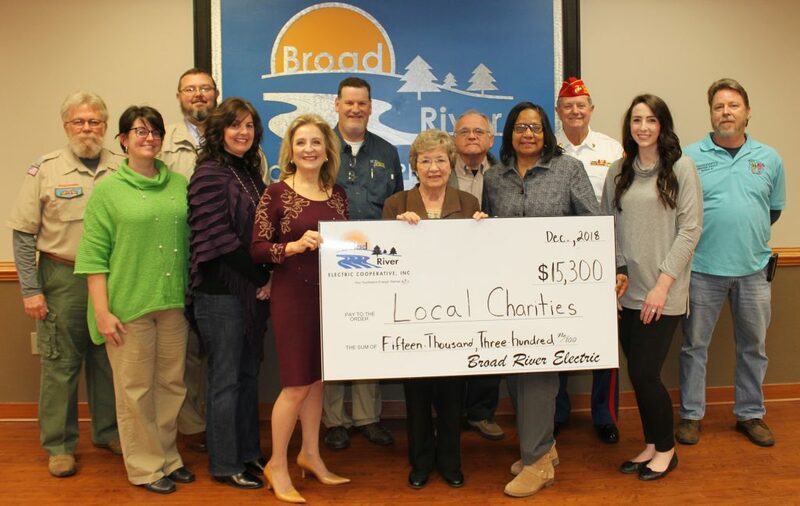 Funds from Operation Round Up are distributed quarterly through Broad River Electric Charities, Inc, which is governed by a 7-member board representing the cooperative and the three major counties it serves – Cherokee, Union, and Spartanburg. Members of the Charities Board are Daisy Lemmons and Nancy Jordan of Cherokee County, Jane Rhinehart and Barbara Whitney of Spartanburg County, Carolyn Belue and Carol Smith of Union County and Broad River Electric President and CEO Terry Mallard (ex-officio). Organizations wishing to request funds can contact the cooperative to begin the application process.